A British government official said the suspects were part of previous security services investigations for possible terror links. LONDON — Two men accused of butchering a British soldier had been investigated previously by security services, a British official said Thursday, as investigators searched several locations and tried to determine whether the men were part of a wider plot to instill terror on the streets of London. The men, suspected of hacking the off-duty soldier to death while horrified bystanders watched, boasted of their exploits and warned of more violence in images recorded on witnesses’ mobile phones. Holding bloody knives and a meat cleaver, they waited for the arrival of police, who shot them in the legs, according to a passerby who tried to save the dying soldier. Prime Minister David Cameron vowed that Britain would not be cowed by the horrific violence, and that it would reject “the poisonous narrative of extremism on which this violence feeds.” Indeed, there were few signs of alarm in the British capital, which has been hit by terrorist attacks during a long confrontation with the Irish Republican Army and more recently by al-Qaida-inspired attacks. Even so, security was increased at military barracks and installations in the capital, with extra armed guards added in many cases. Police said extra patrols were added at sensitive areas, including places of worship, transport hubs and congested areas. 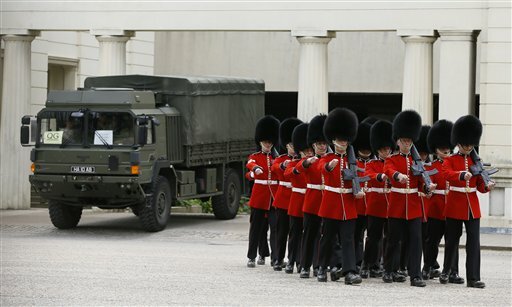 Wednesday’s attack took place near a military barracks in the Woolwich area of south London. The scene was bizarre in a prosperous capital known for its decorum: A man hacked to death in mid-afternoon, lying on the ground dead as the two alleged assailants talked with shocked bystanders and tried to score propaganda points on video cameras while apparently waiting for a bloody confrontation with police. There was little hard information available about the wounded suspects. Police gave no details of their injuries or conditions. They did confirm that the victim was a serving British soldier. His family has asked that his name not be immediately released. After the killing, one of the attackers was recorded on numerous amateur videos making threats, explaining the reason for the crime, and shouting political slogans while gesturing with bloodied hands and waving a meat cleaver. The camera then panned away to show a body lying on the ground. This video, with its venomous threats, may provide the lasting image of the tragedy. A British government official said both suspects were part of previous security services investigations for possible terror links. The official, who spoke on condition of anonymity because he was not authorized to speak about the investigation, said he could not provide other details because the suspects may face trial. Investigations by Britain’s domestic security service, MI5, can include undercover surveillance, phone tapping and communications intercepts. Police in the county of Lincolnshire in eastern England said a property was being searched in connection to the attack in Woolwich. Police said a search warrant had been obtained but would not provide details about the search. Police were also scouring the attack site for further clues. There was also a police raid on a public housing complex in east Greenwich just outside of London thought to be related to the attack investigation. The incident unfolded Wednesday afternoon when officers responded to reports of an assault just a few blocks from the Royal Artillery Barracks in Woolwich. Fred Oyat, 44, who lives in a high-rise nearby, said he heard four gunshots and went straight to the window. Witnesses recounted seeing the suspects — armed with meat cleavers and possibly a firearm — rushing toward police when officers arrived on the scene. Police then opened fire. Images from the scene showed a blue car that appeared to have been used in the attack, its hood crushed and rammed into a signpost on a sidewalk that was smeared with blood. A number of weapons — including butchers’ knives, a machete and a meat cleaver — were strewn on the street. The Associated Press examined the footage to verify its authenticity, cross-referencing images from the scene, aerial shots, the location of a car behind the alleged attacker and the appearance of a body and a car in the background. There was no immediate way for the AP to verify who the cameraman was. Other images showed the second suspect clutching a long knife as he engaged in conversation with a woman who British media said tried to intervene to prevent further bloodshed. Police defended the speed of the department’s response to the attack. In a statement, Assistant Commissioner Simon Byrne said police were on the scene nine minutes after receiving the first emergency call. Once it became clear that firearms were involved, firearms officers were called and arrived 14 minutes after the first call to police, he said. Britain has been at the heart of several terror attacks or plots in recent years, the most deadly being the 2005 rush-hour suicide bombings when 52 commuters were killed. More recently, Parviz Khan was convicted in 2008 of plotting to kidnap and behead a British Muslim soldier in Birmingham. Late Wednesday, riot police were deployed in Woolwich as about 50 men waving the flag of the far-right English Defense League gathered, singing nationalistic songs and shouting obscenities about the Quran. Tom Martin, 26, who attends college in Woolwich, said there are concerns about confrontations with the league.